Have fun hunting for Easter eggs and chocolate bunnies. Enjoy dinner with friends and family. Have a very relaxing weekend. 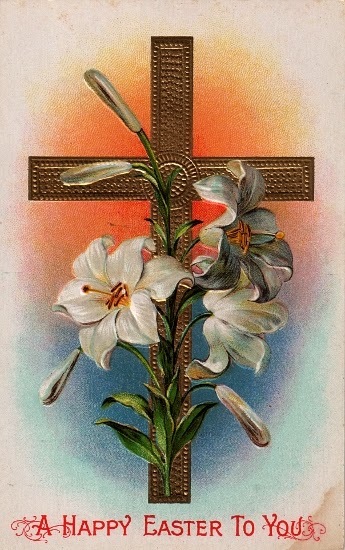 Here are the last of the Easter images for this year. 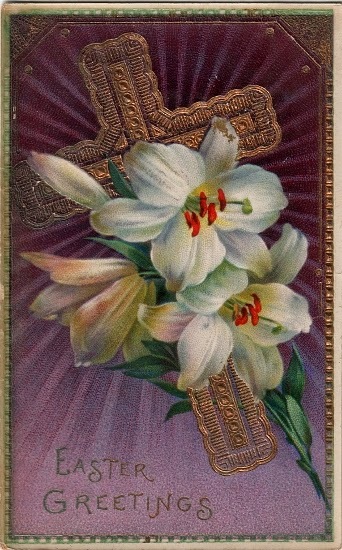 Years ago I bought a group of Easter postcards on Ebay and these cards were part of that group. 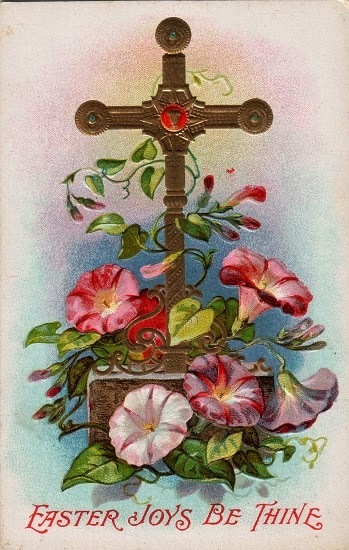 I love flowers and the flowers pictured on the postcards were not what we commonly see today, especially associated with Easter. None of the following cards were used. They may have been old store stock. The first group of six cards are quite beautiful. 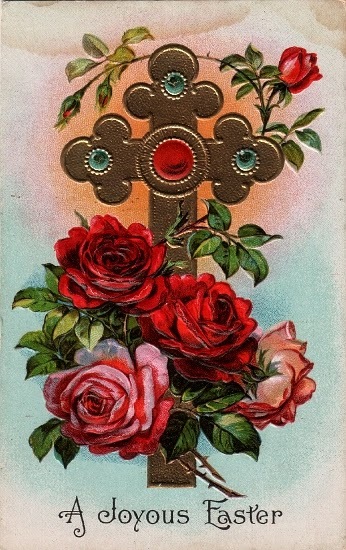 All of the cards have the cross in various forms on it accompanied by flowers. The colours and draughtsmanship are superb. They are embossed as well. 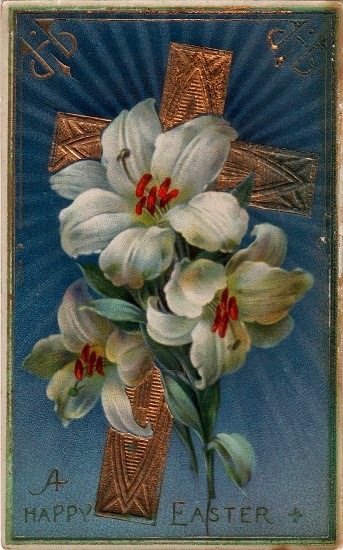 The crosses are gold ink and the design that you see on each cross is accomplished by the embossing process. I was looking up the language of flowers to see if there was any meaning in the flowers. Dahlias stand for elegance and dignity. I do not know what the deep red colour would mean in conjunction with the flower. In the language of flowers the red rose stands for true love while the pink rose stands for desire, passion, joy of life, youth, and energy. 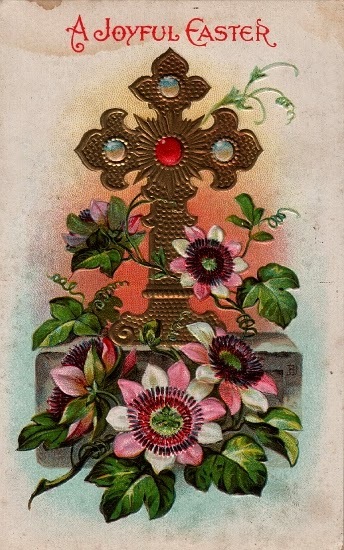 The passion flower stands for faith and religious fervour. The day lily stands for wealth, pride, and prosperity. These cards may or may not be sending these wishes to the recipient but this was a time when people were reserved, supposedly. Morning glory is such a lovely flower. The sentiment sent would be one of affection. Majesty and honour, purity of heart, virginity, it's heavenly to be with you, and youth are the messages sent with lilies. 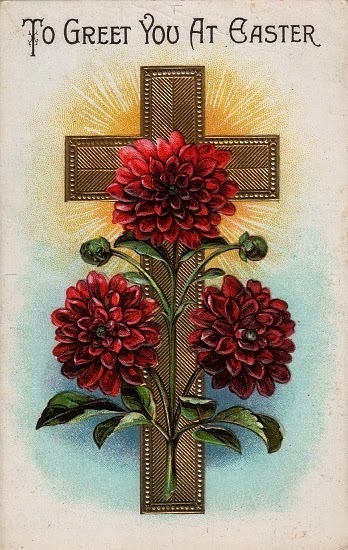 These two cards are more traditionally religious in their treatment. 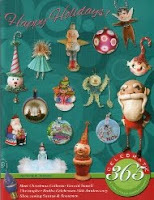 The embossing is very beautiful and they have a lacquer finish on the surface. 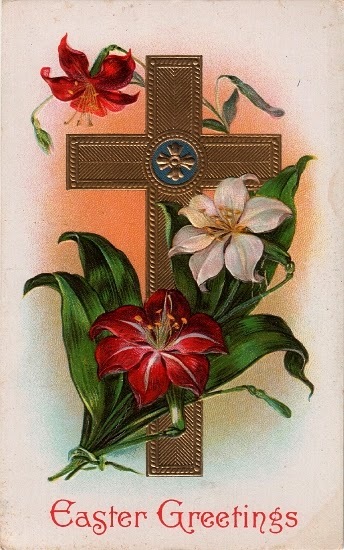 Whether or not any sentiments were implied, the unusual crosses paired with the uncommon flowers make for very beautiful images. Thank you so much for all the images........I love it! I hope you're having a wonderful Easter Day!